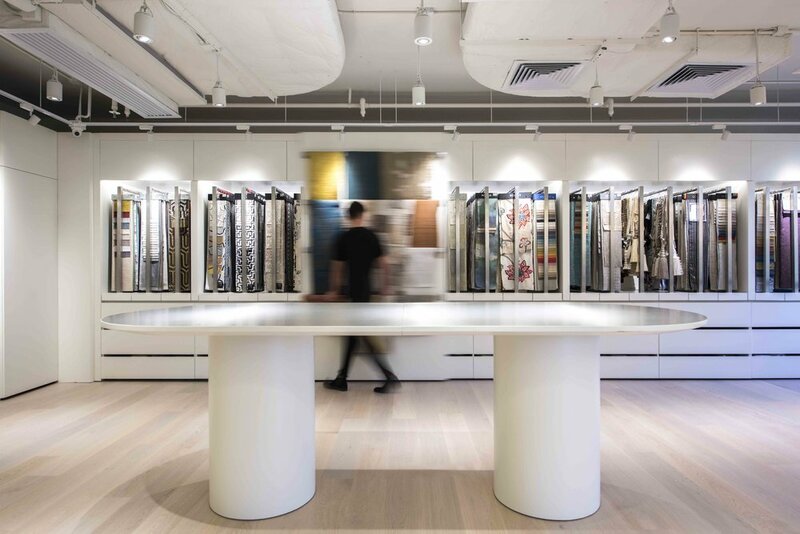 Bean Buro was tasked to design a new retail showroom office in Wong Chuk Hang in the Southside of Hong Kong Island for the fabric company Cetec to showcase high quality fabrics from their own as well as partnering brands. The main front of house customer space should store and display a large amount of products, to support the viewing of fabric samples for inspiration, with variety of seating areas for customers to work, inspect samples and carry out discussions with supporting staff. The project should also accommodate the employees to work in the same unit with a pantry, a meeting room, and the possibility of transforming the unit for large events. The response is a spatial composition that blends the customer areas and staff areas into one connected open space, with maximum connections out to the green mountain views and preserving natural daylight into the space. Instead of creating a traditional back of house for the employees, the design pushed for a contemporary setting of allowing employees to work in the same open space as the customer spaces, create a coworking like environment. This encourages a higher level of well being for the employees to benefit from more natural daylight and a space that feels open and fresh, while also achieves a higher efficiency in allowing better connections between the customers, products and the staff. Inspired by fabric reel structures, the main architectural feature is a large cylindrical display unit with fabric samples vertically hung on the circumference for easy browsing, positioned close to the entrance to entice customers to browse through the hero products for inspiration. The cylindrical volume is approx. 6 metres in diameter, concealing a semi private meeting space in the centre, lined in acoustic fabrics and a writable surface at the entry portal for design workshop events. The acoustic panels are easily removable with clip on fabrics that can be changed easily. The cylindrical volume is lit externally and internally by two circular rim lights at high level to create a strong identity from afar and to wall wash the fabrics. A long built in bench with seat pads has been designed along the panoramic windows to allow customers to sit, work and carry out discussions, and enjoy the natural daylight and views out. A full height mirror has been installed at the end wall to virtually continue the optical effect of the long bench. The corner display walls have been designed with high quality timber veneer finish, with display niches, sliding display niches for catalogues, hanging bars, and pull out tables for ad hoc discussions. Rolled wall covering samples are installed on a wall to allow customers to pull out for viewing. Other shear fabric samples can be clipped on the ceiling tracks installed along the windows for viewing. In order to allow the fabric products to be appreciated without distraction, the overall materials finishes palette is kept simple and neutral, with a light coloured wood texture on the floor and corner display walls to create a sense of warmth, and to subtly respond to the heritage of the various classic fabric brands. High quality carpet made of recycled fishnet is used in the staff area and the meeting room area to improve acoustics. A brushed stainless steel metal finish with a cool colour tone is introduced as a highlighted accent in the reception joinery, and as edging details in the display areas, to create a materials contrast between the hard and the soft elements of the space.